If you love a salty pizza, you need plenty of olives. 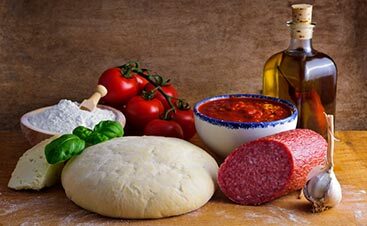 Whether you love black or green, the fruit gives your favorite pies a distinct taste that balances the acidic flavors of the sauce, the spiciness of the sausage and pepperoni, and the sweetness of peppers. The olive has a deep history and the long process of making the olive edible as well as turning it into oil, making this topping a favorite for both veggie and meat lovers. 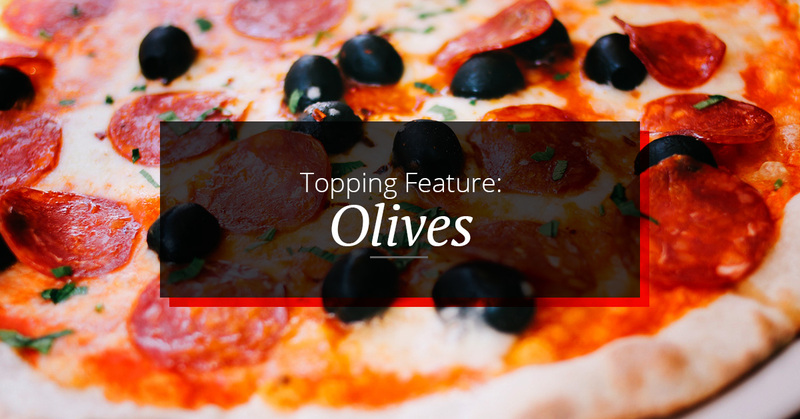 Let’s learn more about the olive and visit our restaurant in Santa Fe to experience tasting the delicious topping. What’s the Difference Between Black and Green? Just like when peppers turn red when they ripen on the vine, green olives are picked before they are ripe and black olives are picked after. Much of the difference in taste comes from the method and duration of the curing process. Olives, both green and black, are inedible when picked directly from the tree. Olives need to be cured by packing them in salt, brine, or water before they can be eaten. Green olives have a more bitter taste and have a firm, dense texture. Niçoise: These olives have a purple color to them and are often used in tapenade or packed with herbs in olive oil. They have a rich, sour flavor and are about the size of your pinkie. Picholine: These olives are commonly used as cocktail olives in martinis, but can also be used to make olive oil. They have an oval shape and a medium flavor. Kalamata: Named after a city in Greece, these olives have a meaty texture and are commonly preserved in wine vinegar or olive oil. There are two methods of preparing this variety, long and short. The long process can take up to three months. Moroccan Salt-Cured: As the name suggests, these wrinkly olives are dry-cured in salt and then preserved in oil. After this process, they look almost like raisins, small and wrinkly. Cerignola: You’ll find this variety on cheese-boards. They are large and have a mild flavor. 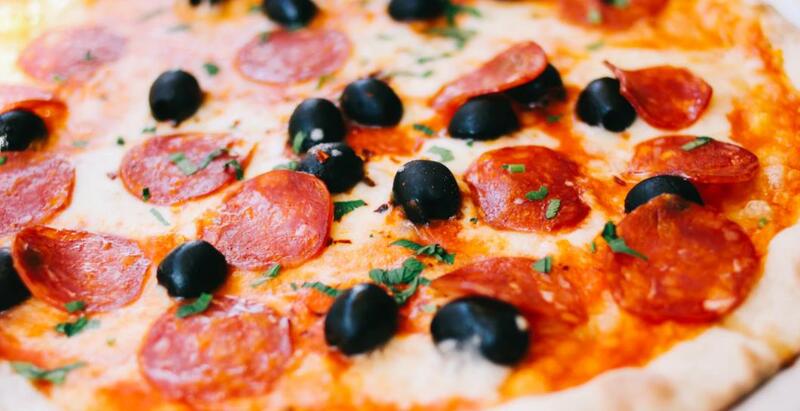 The most common olive used on pizzas is a canned variety from California. A step in the curing process allows them to have a less bitter flavor. The firm texture and mild flavor make both the green and black variety perfect for pizza toppings. Supreme or vegetarian pizzas wouldn’t be the same without this historic fruit. 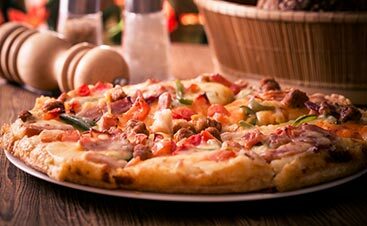 With peppers, sausage, mushrooms, and cheese, the beautiful blend of flavors makes an average pizza one that is hard to forget. 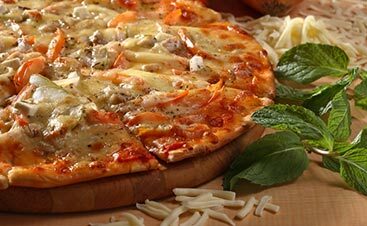 If you want to experience the flavor of an olive-topped pizza, visit our restaurant tonight in Santa Fe.